Readers of this blog will be familiar with hearing the voluntary sector referred to as the ‘third sector’. It is not clear whether the public or private sector comes first, but there is no doubt these are the other two and that both come before voluntarism. Geoffrey Finlayson influentially popularised Beveridge’s notion of the ‘moving frontier’ between voluntarism and the state. Indeed, the relationship and interaction between the two has been a key theme in both historical and contemporary debate. Last year a new journal called the Voluntary Sector Review was set up and every one of its five issues so far has featured some discussion on the topic. Likewise, in the first months of this blog we have featured pieces on New Labour’s ‘compact’ with the voluntary sector, the impact of public spending cuts on the voluntary sector and the government’s ‘big society’ agenda. Historical and contemporary comment spends much time on this ‘moving frontier’ between voluntarism and the state. There is an element of self-fulfilling prophecy in the fact that these debates are perpetuated by the existing debate. Meanwhile, the other moving frontier – the relationship and interaction between charity and commerce – remains largely overlooked. Some aspects of this relationship are more commonly addressed than others, essentially business as a source of income for charity. Whether this is the long-established tradition of mercantile philanthropy or the supposedly new ‘philanthrocapitalism’, business donations have been long discussed and have been the subject of contributions to this blog. However, as well as the flow of money, we should also give some thought to the flow of ideas and practices from the private to the voluntary sector. If philanthropy in the twentieth century had to find a pitch for itself in relation to the state … in the nineteenth century, I would argue, it had to do so in relation to the market. By and large it retreated from engagement with the market, scared off by the political economists. Consequently, he suggested, ‘the most characteristic forms of philanthropy became the expenditure of money on large scale projects of civic improvement’, while philanthropy itself came to be ‘measured in cash terms’ and focused on ‘less controversial schemes’ such as hospitals and schools, libraries and parks. Even in these areas, the private sector has always had an influence on how the voluntary sector has behaved. My own VAHS seminar and my recently-completed doctoral thesis recognised this while asserting the charitable character of Britain’s pre-NHS voluntary hospitals. In particular I have considered the early twentieth century’s fluctuating boundary between charitable and commercial approaches to payment. In fact, paying for health was part of both voluntary and public hospital provision before the NHS. The 1929 Local Government Act granted local authorities the power to appropriate poor law infirmaries for the use of the local population (see Levene 2009). 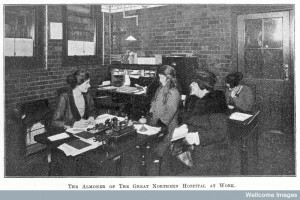 When they did this, they often replicated the arrangements of the voluntary hospitals which included a variety of payment systems. 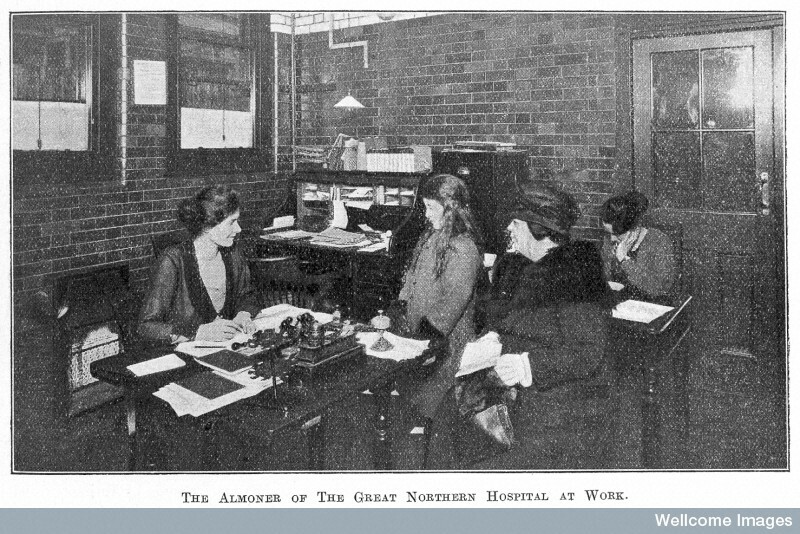 Traditionally admission to a voluntary hospital had been granted by charitable donors, but in the early twentieth century it became far more common for the patients themselves to make a financial contribution. However, this was not necessarily a commercial arrangement. The voluntary hospitals had been established to provide medical services for those unable to afford a doctor’s fees and still continued to do this while either taking payments in advance via pseudo-insurance contributory schemes or at a rate judged appropriate by a medical social worker. The Lady Almoner, as she was known until the 1960s, was able to pass patients entirely free or for a voluntary fee, which at up to one-third of the cost to the hospital was still substantially subsidised. However, at the same time it also became standard for voluntary hospitals to make provision for those who could afford a doctor’s fee. These middle-class patients would be excluded from the charitable wards by income limits, while the payments would be compulsory and would include a private fee for their doctor. Writing in the 1920s, one Oxford doctor thought such a development at the Radcliffe Infirmary was ‘inevitable’, although he did not see this as embracing a business model: ‘No hospital can be run on business principles unless the profit is assessed in terms of its reputation with the public’ (Gibson 1926, pp. 280 & 278). This may not have been an outright conversion to a commercial approach, but it was a reinterpretation of the charitable mission of a voluntary hospital that needed justifying. During 1930s parliamentary debates, the traditional view that middle-class admission constituted an ‘abuse’ of charity was clearly still influential, as Labour politicians and others expressed concerns that it would erode provision for the sick poor. Meanwhile, supporters of the King’s Fund argued for a revised definition of the sick poor that would include ‘the blackcoated poor of the middle and professional classes’. 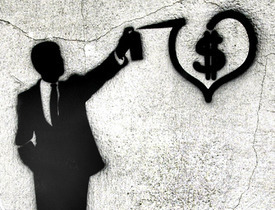 Attitudes towards charity and recipients of charity have changed further still since. 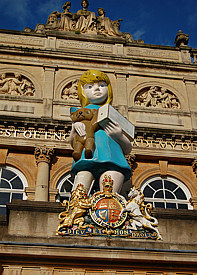 This has prompted an artwork simply called ‘Charity’ by Damien Hirst, originally part of his Romance in the Age of Uncertainty exhibition and currently on display in Bristol. For twelve months, Charity – Damien Hirst’s twenty-two foot high painted bronze statue – will stand on the RWA’s balcony as a monumental and epic comment on social injustice. The Spastics Society collection box of a girl with teddy bear and leg in callipers was a familiar site in the 1960s and ‘70s, but fell out of fashion in the 1980s as a disempowering image of pity. Hirst has remade the splinted girl, scuffed her appearance and burgled her charity box to highlight the erosion of society’s values and put the issues on a pedestal. Looking across at the Victoria Rooms’ regal statue of Edward VII, Charity subverts the celebration of nobility and the monarchs who began the age of charity, its towering wretchedness standing as a massive reproach, the scale of our refusal to acknowledge a failure in charity. The work of historians such as Dr Alex Mold can help us to understand these changes, as the voluntary sector with its new ethos of empowerment played its part in the consumerisation of British society. But how far have charities gone, or how far might they go in future, in adopting a commercial, consumer approach? What happens if a resident for whatever reason stops paying their bills? … our own charitable ethos at Nightingale is one of compassion and care. Ultimately we would not ask somebody to leave purely on the grounds of finance. In fact, we never turn people away on these grounds. We exist to provide care – not to throw people out onto the street if they run out of money. This is the difference to me. This resonates strongly of the debate surrounding patient payments in the pre-NHS voluntary hospitals, suggesting certain continuities in the relationship and balance between charity and commerce. However, there have also been changes. Notably, the rise of the contract culture (see Kendall 2003, pp. 78-79) has forced voluntary organisations to conduct themselves increasingly in the manner more associated with business. Indeed, the enhanced role granted to the private and voluntary sectors in the provision of public services is largely based on the assumption that the one will act more like the other. This was evident in the language employed by Patricia Hewitt as Health Secretary, when she frequently referred not to private and voluntary sectors, but simply to ‘the independent sector’. Last week’s signing of a 10-year contract for a private ‘mutual’ to run an NHS hospital for the first time shows that the boundary between the public and private sectors is still in flux. For those of us interested in the changing fortunes and role of the voluntary sector, the impact of this remains to be seen. What we do know from researching the past is that this is only the latest chapter in a continual renegotiation of the place of charity in society. An animated RSA public lecture by Slovenian philosopher Professor Slavoj Žižek considered the influence of charity on consumerism, highlighting that the relationship is not one way and rightly recognising that this is an ongoing process. More work by historians and discussion specifically on the relationship between charity and commerce will help us to better understand what is happening today and where we might be headed next. This entry was posted in George Campbell Gosling, New Researchers, Podcasts, Politics, Reflections and tagged big society, business history, compact, consumerism, health, Hugh Cunningham, philanthropy, private sector, voluntary sector, William Beveridge. Bookmark the permalink. Enter your email address to receive our weekly short essays direct to your inbox.